Easy 3 ingredients, 10-minute Caramel Sauce. Rich, buttery, and creamy, this salted caramel sauce is a pantry staple that’s simple to make ahead of time. You’ll love how this quick caramel sauce comes together in no time at all. Serve over ice cream, apple crisp, cakes. and desserts. I can’t tell you how many times I reach into the refrigerator or pantry to grab a jar of caramel sauce only to find that I’ve used it all. Nothing ruins the moment more than knowing that the caramel sauce you’ve been looking forward to all night, won’t be part of your decadent dessert. Having extra caramel topping around the house is a problem I like to have. But, for the days when I’m shocked to learn that I finished my last jar, this homemade caramel sauce recipe comes in handy. If you’ve never made a homemade caramel sauce then you’re in for a treat! Anyone can make this extra rich and delicious recipe in no time at all — and with just a few simple ingredients. I love recipes that use just a few ingredients. First of all, I keep half & half stocked in my refrigerator pretty regularly and if you’re like me, then go ahead and reach for the carton to use in this caramel sauce recipe. If you’re feeling fancy or are looking for a recipe to use up extra heavy whipping cream in, feel free to use heavy cream in this sauce. Homemade caramel sauce is made with butter, sugar, and cream. That’s just 3 ingredients! Plus, if you crave salted caramel sauce, just add some salt to this recipe. I like to use fleur de lis salt but any salt will do! The most important thing to remember when making caramel sauce is to have all the ingredients on the counter ready to go. I like to add a little water to the pan at the start of cooking to help the sugar from sticking to the pan. Of course, you don’t need to use water, but if it’s your first time making this caramel sauce recipe, have a little water by your side in case your sugar isn’t melting evenly. 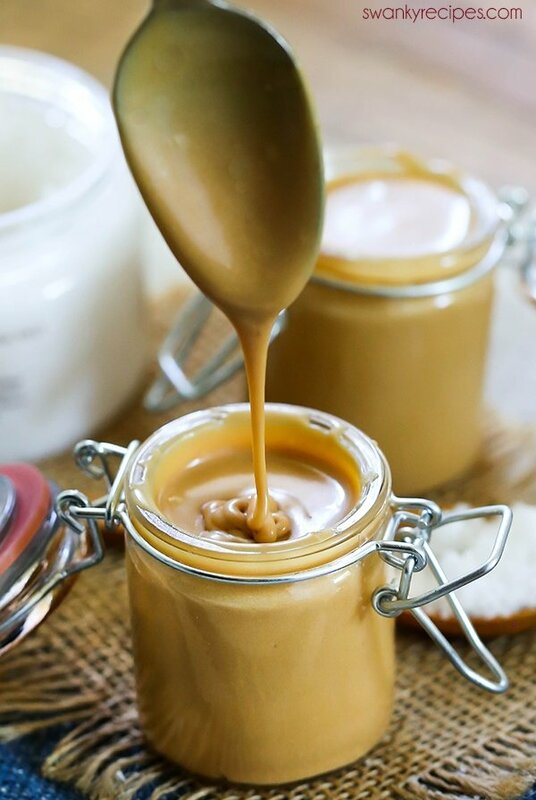 This homemade caramel sauce recipe isn’t hard to make and once you have your hand at your first batch, you’ll always come back to making this homemade version and skip the store-bought variety. Plus, once you’re comfortable making caramel sauce, it’s even easier to make caramel candies. I like to make one batch at a time, then store it in the refrigerator until I’m ready to use it as a topping on ice cream, apple crisp, caramel lattes, cupcakes, and even popcorn. This recipe is perfect as a homemade holiday food gift during the holiday season. I bought these tiny jars from TJMAXX and they are perfect to gift during Christmas! Easy 3 ingredients, 10-minute Caramel Sauce. This salted caramel sauce is rich, buttery, and creamy. You'll love how this quick caramel sauce comes together in no time at all. Serve over ice cream, apple crisp, cakes. lattes, and desserts. Heat a large 2 or 3-quart heavy bottom stockpot set over medium-high heat. Caramel sauce will rise when butter and cream are added towards the end. Add water and sugar. The water will help the sugar to cook evenly. More water can be added if you are having trouble with sugar sticking to the bottom of the pan. Whisk mixture continuously. I used a silicone spatula and whisk to help me stir the mixture. Careful not to fling sugar as it will be hot. This step may take up to 5 minutes or longer. Keep whisking until sugar dissolves and turns to a golden brown color. Carefully remove any harden sugar chunks with a spoon that are not melting. Once sugar is completely melted, carefully add in butter. The mixture will rise in the saucepan, keep stirring until melted. Remove pan from heat and carefully pour in half and half or cream. Whisk to combine. Stir in salt, if using. 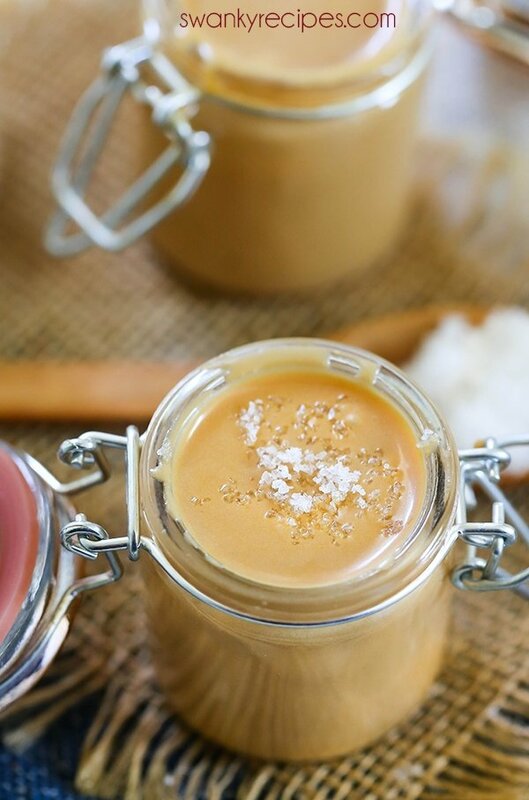 I like to add salt to make this salted caramel sauce. 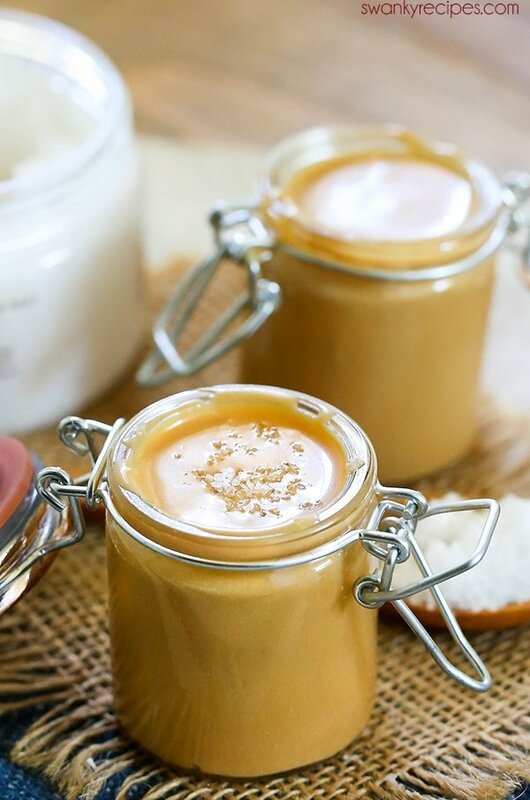 Allow caramel sauce to cool; 10 minutes then pour into an 8-ounce mason jar with a lid. Sauce will thicken more. Refrigerate up to 2 weeks. So easy! 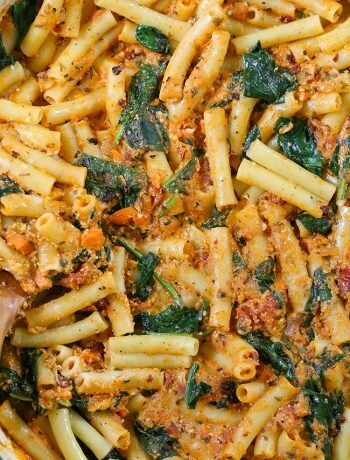 I love easy affordable recipes that are ready in less then 15 minutes. Caramel is always a treat! Oh my goodness, what delicious decadence! Love that enticing little sprinkle of salt on top, too – big punch of flavor, and so pretty! Great tips on having everything totally at the ready before you start cooking, and on making this as a DIY holiday gift (I mean, who wouldn’t love receiving THIS?!?!). Great post! caramel sauce is almost staple sauce in my house. We love it so much. İ make anything from from it or just flush over the ice cream. Love your easy and simple recipe, absolutely keep it. We could all use a good caramel sauce recipe! Looks delicious! I would not have thought that there are only a few ingredients in caramel sauce. It looks delicious. 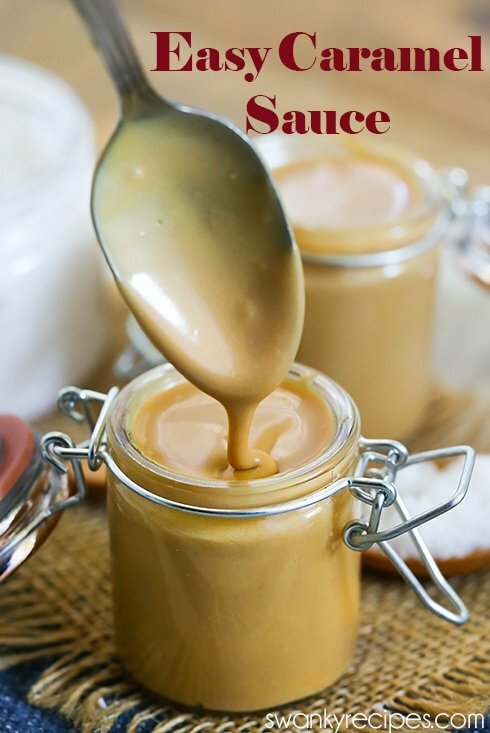 Wonderful clicks and love caramel sauce.Your recipe looks so easy and nice to put together. WOW! I would put this on absolutely everything! What a great thing to have in the fridge all fall! A good caramel sauce is essential in the Fall. Just think of all the goodies it can cover. Delicious apples, pies, pears, cakes so on and so on. Then you can just drizzle it over ice cream to give it some pizzazz. That looks so tasty, thick and gorgeous. I can almost taste it from here. I have never tried making this on my own. I didn’t know it was so easy. 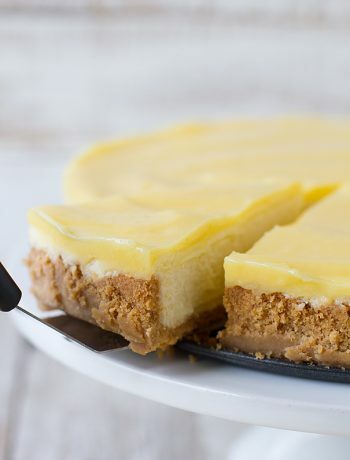 Gotta make this:) Thanks for sharing your recipe! I love how quick and easy this is! And it looks sooooo super smooth and creamy. A fantastic treat! I want to drizzle this on everything and dip everything in it. 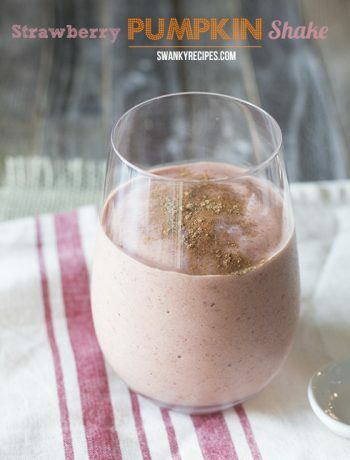 Perfect timing for me to find this recipe – we’re about to go apple picking!